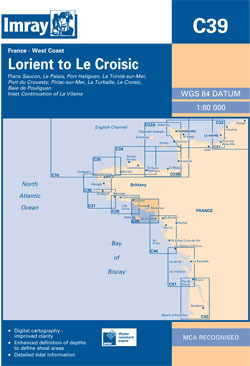 South coast of Brittany from Lorient to Le Croisic. Scale: 1 : 78.500. One-minute gridlines. Larger scale plans of Le Pouliguen, Port Haliguen, La Trinite-sur-Mer, Port de Crouesty, La Turballe, Le Croisic, Le Palais, and Pornichet. Tidal stream diagrams. 2017 Editon- Fully modernised and updated throughout.